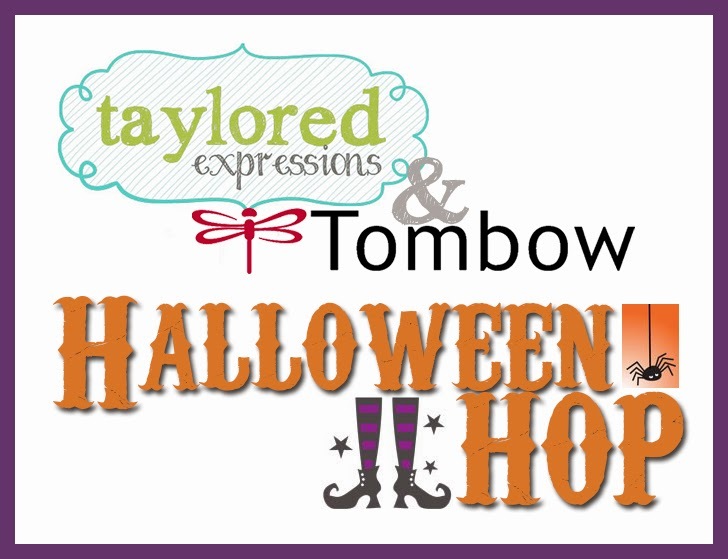 Taylored Expressions and Tombow USA have partnered together for a fun-filled Halloween Hop! Some of the designers from both design teams have created projects to share with you! The TE team was generously provided with a Dual Brush Pen Set (Groovy), Fastener Tabs, MONO Adhesive Permanent and MONO Glue Stick. Thank you for your generosity, Tombow! Giveaway details: To get you into the Halloween spirit, we're giving away a fa-BOO-lous prize! 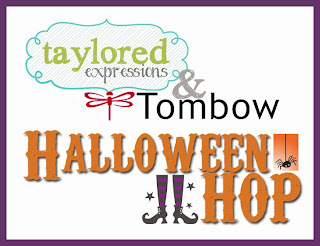 To enter, leave a comment on each hop blog post (links below) and "Like" both TombowUSA and Taylored Expressions on Facebook. 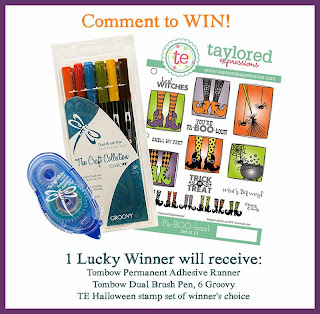 One winner will be randomly chosen from all hop comments to win a prize package that includes a Tombow Permanent Adhesive Runner, a Tombow Dual Brush Pen Set of 6 Groovy, and a Taylored Expressions Halloween stamp set of the winner's choice! Comments close at 11:59 pm PST on Sunday, October 27, 2013. Thanks so much for stopping by! Best of luck to all of you who enter the Giveaway! Paper: Halloween Parade (Doodlebug), Choice Black, Choice Watercolor, Choice Snow White (TE), Acetate. Accessories: Taylored Dies: Candy Monster coordinating, Snow Globe (TE); Standard Circle Nestabilities - Sm & Lg (Spellbinders), Groovy Dual Brush Pens, MONO Permanent Adhesive (Tombow USA); White embossing powder, Star sequins, Black hemp cord, Foam tape, Thread, Sewing machine. Thank goodness that you stuck with this card because it turned out to be a super cute one! This is fantastic Stephanie! LOVE the star shaker material and your coloring is fantastic! love that image! What a sweet card! That little guy is too cute! Great job! Well, the third time was the charm for sure! 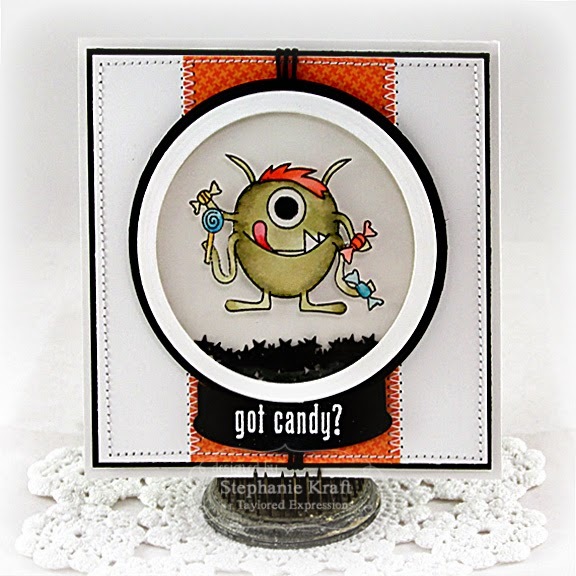 Your little monster is stinkin' cute and anyone would love to receive this card! Your one-eyed monster is so scary..okay, he's actually super duper cute! 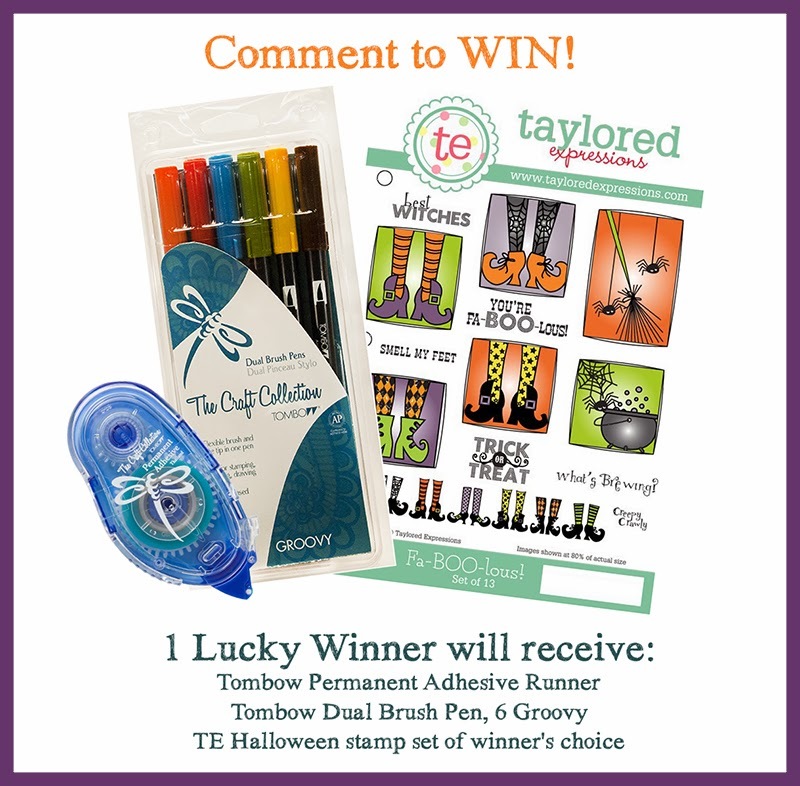 TE + Tombow + your creativity = fabulous recipe for inspiration! Thanks for sharing! Oh how cute and adorable card!!!! That little monster certainly is charming...must be something magical about the #3 ;)... Great little card, which is sure to make the recipient grin! Third time is the charm, I guess. Turned out wonderfully. That one-eyed candy monster is so funny!! Super cute Stephanie! That little guy is way too cute to spook! :) Love your fancy stitching! What a cute monster!!! Love your card! I think I am in love! This little one eyed candy monster is welcome in my home any day! Love your card! TFS! Super cute! Great blog hop too! That monster is super cute! third times a charm and it came out charming. What an adorable monster! Love the shaker box. Trick or Treat.... Love the monster!!! Third time is a charm! Adorable monster! Boo tiful colors! 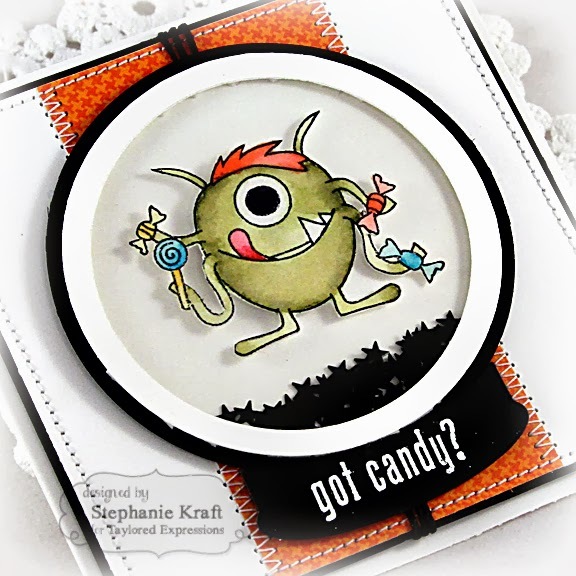 Cute shaker card - the little monster is too funny. I always forget about shaker cards until I see a cute one like yours! This is so creative!! Wish I had that much talent. Thanks for sharing it with us! It is adorable! Just too cute! Isn't that monster just the very cutest ever. Love the shaker card idea. Third time was definitely worth it. It's super cute! Great coloring on your fun card! Love Tombow and TE products! Such a cute shaker card! Love the Candy Monster! OMG what an incredibly cute card! So worth the effort! So fun! Oh gosh I wish I'd thought of that! Love that little monster. Great card. This was a great use of the Taylored Expressions products. Way to pull everything together!!! How much fun is that??? What a great surprise for some little pretty who visits on Halloween. Great card! That monster is so cute, thanks for sharing. What a fun project, Thanks for sharing. I want to make shaker cards! This is my ultimate favorite halloween card! I just have to try and make one like this!